Travel two miles north of Bend on Highway 97 toward Redmond. 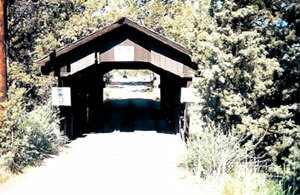 The bridge is located on Bowery Lane, west of Highway 97. Rock O' The Range is Oregon's only covered span located east of the Cascade Range and one of the few covered bridges built in the last two decades for private use. It represents an architectural style unique to Oregon. In developing a parcel of land north of Bend, William Bowen needed to build an access road across Swalley Canal to his property. He was inspired by Lane County's Goodpasture Bridge and decided that his bridge should be covered. Bowers instructed Maurice Olson, a local contractor, to construct the bridge according to a picture of a covered bridge found on a calendar. Specially ordered Douglas Fir timbers were placed on concrete pilings to support both the dead weight of the bridge and the live load of passing traffic. Although small timbers were added to help strengthen the span, technically a truss arrangement is not used. Cedar siding, a shingle roof and windows were added refinements. The bridge was completed in 1963 for about $4,500. Bowers has dedicated the bridge to the public. Maintenance cost for the bridge is borne by landowners who use the bridge for access to their property. High loads have splintered the portal boards and cracked roof braces, prompting the posting of a sign to alert motorists of a 9-foot 1-inch vertical clearance. Because the span is not actually supported by a truss, a letter has been added as a last character to the World Guide Number to denote that it is not a "true" covered bridge.